Pray for all the resources and creativity needed to fulfill the intentions of God in the state of Louisiana. State Information: Situated in the Deep South, Louisiana, the “Pelican State,” has a colorful history and was named in honor of King Louis XIV. 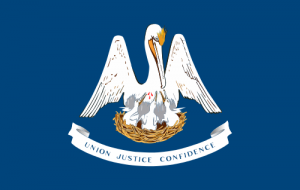 A strong French influence is still evident throughout the state–its capital city is named Baton Rouge, French for “red stick,” because the French-Canadian explorer Pierre Le Moyne d’Iberville visited the area in 1699 and observed a red cypress post. Today the city of New Orleans is known for its Mardi Gras and jazz festivals.